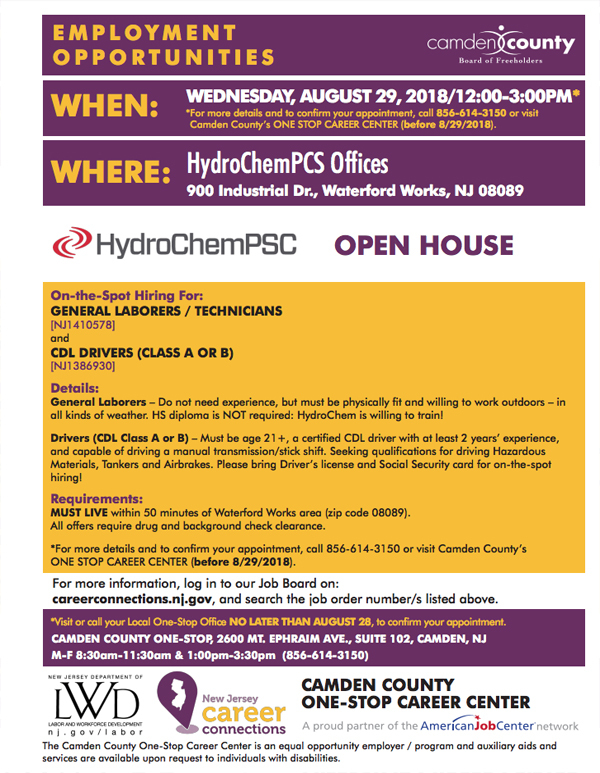 HydroChemPSC will be holding an Open House on Wednesday, August 29th at the Camden County One-Stop Office. The Camden County One-Stop Office is located at 2600 Mt. Ephraim Ave., Suite 102, Camden, NJ. LL candidates MUST be prescreened and scheduled for an appointment prior to the recruitment date by their local One-Stop Office. One-Stop Hours are Monday through Friday, 8:30 AM to 11:30 AM and 1 PM to 3:30PM. For more information, call (856) 614-3154.